saw and fell in love with the money clip that John Travolta was proffering. He asked me if I could make a clip “just like it”. I respect the sanctity of another person’s work. but I would not make a “copy” of the one in the movie. I increased detail in the scales and re-shaped the skull. the jaws articulated to grasp the bills but the detail was more intense. bought it and decided he wanted to “up-grade” the clip: a larger version. making it more distinct than the original design and provided a larger bite for the bills. This Dragon Money Clip I named “Flame”. My most recent commission is a one-of-a-kind Dragon Money Clip. even more detail in the scales and the eyes. and the “whites” of the eyes are in Sterling as is the entire piece. that would be the envy of any High Roller. Bikers and other lovers of the Skull. Flame and now the new GIANT Dragon Money Clip in my website. seen in the Travolta and Cage movie: “Face Off”. and produced the Dragon Money Clip. complete with eyes of jewels and a working jaw to clutch (perhaps “bite”) the bills. 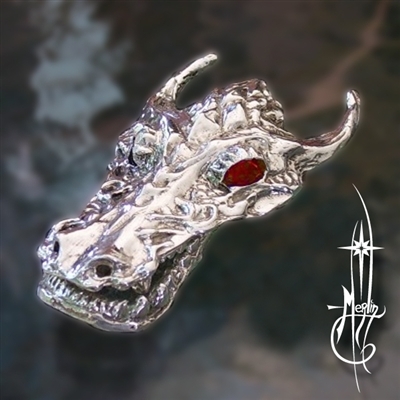 larger version of the Dragon Money Clip: Flame the Dragon Money Clip. but an original face of a dragon. but it has the stylized scales for of cranium containing the spring that works the jaw. all with the intensity of a dragon gaze. with a dragon image stamped across it. flames and teeth and eyes are all there. sleek, durable and compact with your wad of bills folded neatly to slip into your pocket. each specially made for the person who orders it. so you will not find them anywhere else. or sketches you make yourself. Designing your own money clip is but one of the services I provide. More about custom may be found here. 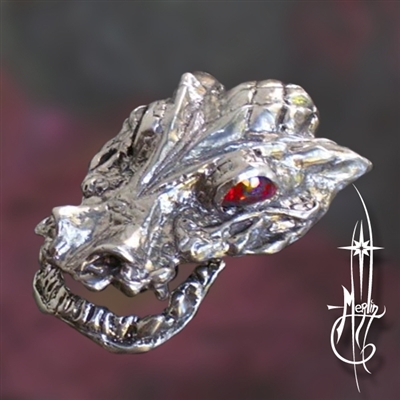 To order your own Flame the Dragon Money clip you may go here. More about Dragon Money Clips! It all started a few years a go when a fellow who was a big fan to the Movie “Face-off” saw and fell in love with the money clip that John Travolta was proffering. He asked me if I could make a clip “just like it”. The problem was that there are copyright issues in design and being as I specialize in Jewelry design I respect the sanctity of another person’s work. I told him that I would be only too happy to make him a Dragon Money Clip, but I would not make a “copy” of the one in the movie. After a little discussion and examining the clip in a screen shot, we decided to re-design the piece: I increased detail in the scales and re-shaped the skull. 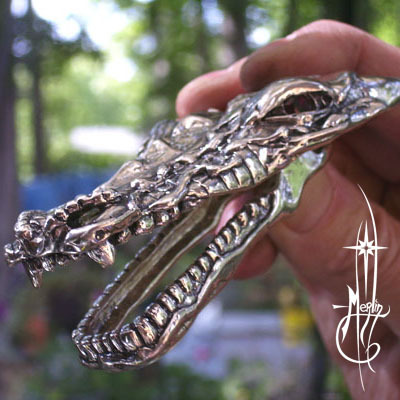 The result was a Dragon Money Clip similar in size, it functions like the original: the jaws articulated to grasp the bills but the detail was more intense. After the creation of the Original, another person liked it, bought it and decided he wanted to “up-grade” the clip: a larger version. And so I increased the jaws, added even more detail in the scales and flames across the face, making it more distinct than the original design and provided a larger bite for the bills. This Dragon Money Clip I named “Flame”. 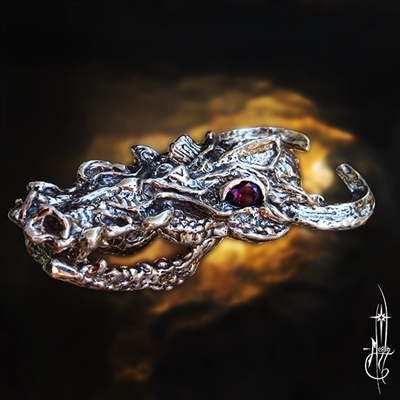 My most recent commission is a one-of-a-kind Dragon Money Clip. The size was nearly doubled (four inches long! ), even more detail in the scales and the eyes. Now the retina and the pupils of the eyes are of garnet and the “whites” of the eyes are in Sterling as is the entire piece. The jaws are also articulated as the original but because of the increased size it can hold a wad of cash that would be the envy of any High Roller. I have also created a variety of Other Money Clips as well, skulls with stones in the eyes, cross bones and a Jolly Roger perfect for Pirates, Bikers and other lovers of the Skull. For your Pleasure, I have posted more images of the original Dragon Money Clip, Flame and now the new GIANT Dragon Money Clip in my website.